choosing the right hotel collection bedding will surely transform your room! People don’t mind spending a few hundred dollars just to enjoy hotel accommodations. But wouldn’t it be a better idea to spend those few hundred dollars once and be able to enjoy the hotel room feel every day? Yes, you can definitely enjoy the ambiance of a hotel room with only a few changes. You don’t even have to change your bed, all you need is a new set of the hotel collection bedding and you can start to change to look and feel of your room without having to spend as much as you would pay for a hotel room. Good thing you won’t need to go to a hotel and try your luck if you could buy the sheets you would love to take home and use for your own room. 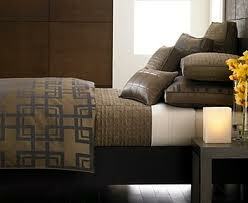 The hotel collection bedding can be found in home depots and they come in a variety of style and brands to choose from. You will surely love to know that these beddings open the possibility of having a hotel room-like bedroom of your own. The best part is you can choose the kind of hotel bedding you want. This means you’ll be able to enjoy a stylish set of beddings without sacrificing your personal style or taste. Sometimes the existing appearance of your bedroom makes it difficult for you to choose the right hotel collection beddings. It may take some time and a few changes before you can choose the right hotel beddings for your own room. On the other hand if you think your room can work well with the elegant and stylish hotel beddings then choosing the right one for your bed will not be a problem. Color can be a good basis for choosing the hotel beddings for your bed. If you base your choice on color alone then it would not be much of a problem. You can choose the hotel beddings that is similar to the existing color scheme you have in your room or you can go for a different color that will still work well and complement the color of your room. The number of pillows you have can also contribute to the choice you make. Hotel beds are not usually as plain as the regular beds. If you are determined to complete the look then it should have the inviting throw pillows other than the main ones you use for sleeping. Make sure that the hotel collection beddings you choose have matching number of pieces for the number of pillows you have. Lastly, even when you want to be stylish it still helps to keep a budget in mind. You wouldn’t want to overspend and regret it. This can definitely ruin the mood and you won’t be able to appreciate the bed you planned to enjoy. Having the budget can also help you to make an easy choice. No matter how stylish the hotel collection bedding is, the entire hotel theme will depend on the choice you made and how you put it all together. Make sure you choose the right one so you can enjoy your very own hotel room amenities in your own bedroom.